How a therapeutic antibody is metabolized in the body is pertinently relevant to its efficacy. Therefore, pharmacokinetics study is an important part of the drug development. PD-1 is probably the most targeted molecule in today’s pharmaceutical industry, thanking to the clinical success of Keytruda® and Opdivo®. Many investigational anti-PD-1 mAbs are being developed. There is a growing need for a standard assay that can be used to facilitate the study of their pharmacokinetics. The enclosed ELISA assay kit for anti-PD-1 h-mAb in monkey serum is based on an enzyme immunoassay (ELISA) between recombinant PD-1 protein (ECD) and a biotinylated anti-PD-1 monoclonal antibody. The method employs the principle of competitive ELISA, allowing quantification of monoclonal anti-PD-1 antibodies in monkey serum. 4. Record the OD readings and analyze the serum concentration. This kit has been tested for multiple investigational PD-1 antibodies, as well as the commercially available Keytruda® and Opdivo®. There is no requirement for the species and subtype of the antibody. There is no longer a need to generate anti-drug antibodies for PK studies. The use of the biotinylated antibody in the competitive ELISA significantly alleviates the issue of background noise issue that often occurs in traditional ELISA method. Upon receipt, please store all items at -20℃. After reconstitution, the stock solution should be kept at -80℃. It is recommend not to freeze thaw more than 3 times. -80℃ for 4 months under sterile conditions after reconstitution. Quantitative Analysis Five Different Therapeutic Anti-PD-1 Antibody in Monkey Serum Samples. 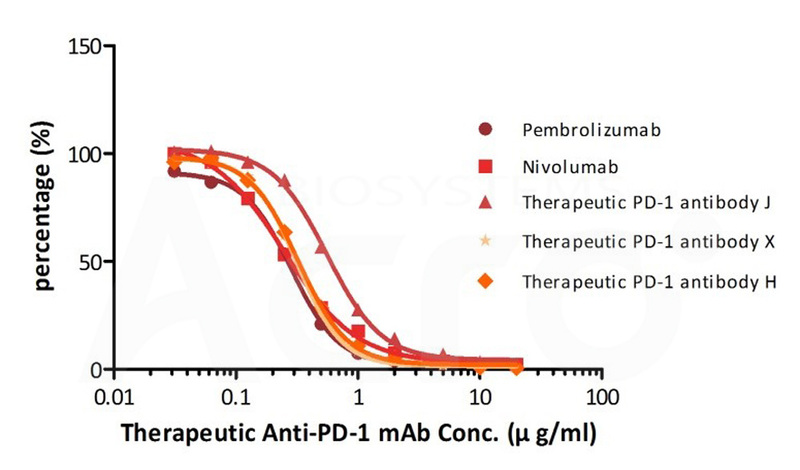 Serial dilutions of the Therapeutic Anti-PD-1 Antibody (1:2 serial dilutions, from 20 μg/mL to 0.039 μg/mL) was added into PD-1: Biotinylated Anti-PD-1 Antibody binding reactions.